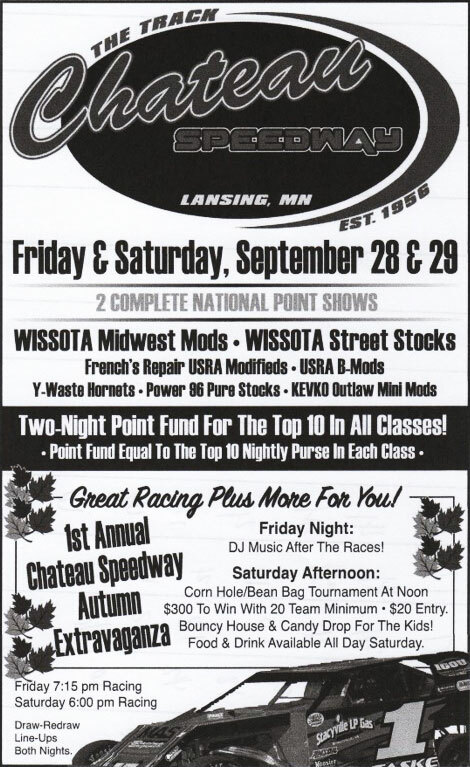 Chateau Speedway, in the middle of a two week break from racing, is still busy working on the plans for the “First Annual Chateau Speedway Autumn Extravaganza” coming up at the end of the month. The two day special is scheduled for Friday Night September 28th and Saturday Night September 29th. Friday Night race time will be the normal 7:15 with the Saturday Night show getting underway at 6:00. Practice for the weekend show will be held on Thursday Night September 28th from 6:00pm -9:00pm. Cost for the practice session will be a flat fee of $30 per car. That fee covers admission for car, driver and pit crew, all included in the $30 charge. The Track will be hosting 7 classes of cars each night with two complete shows, heats and features, and a full purse paid each night. There will also be a third purse for the top 10 drivers in each class with point totals from the two nights tabulated to set the top 10 drivers in each class for the 2 day Extravaganza after Saturday Night. There is Special Pricing for the weekend. For the drivers there will be an entry fee, in addition to the pit passes for the sanctioned classes. The USRA A Mod entry fee will be $30, with a $20 entry fee for the USRA B Mods, and the WISSOTA Midwest Modifieds. The WISSOTA Street Stocks will have an additional $10 entry fee. No entry fee is being charged for the non sanction classes, Power 96 Pure Stock, Y Waste Removal Hornets, and KEVKO Outlaw Mini Mods. However the Sanctioned classes can save $5 on there fee by purchasing there pit passes for both nights on Friday. Pit passes each night are $30. So drivers in the A Mod class would pay $85 instead of the $90 if they pay for both nights of racing on Friday. The B Mod Classes would pay $75 if they pay for both nights on Friday and the Streets would be $65 for the entry fee and 2 night pit passes. Other classes and crew members would be the straight $30 each night. Grandstand ticketing for the special will be $15 a night, but again fans can save $5 by purchasing a two night pass on Friday for $20. The Student pricing for 6-12 year olds will still be $5 a night and Under 5 remains free. Among the activities for the weekend will be Music on Friday Night provided by “Remedy Music” with Jason and Christy Augustine providing the DJ service. Music Friday Night will start after the conclusion of the last race. On Saturday at Noon will be the First Annual Corn Hole Bean Bag Tournament with a $300 top prize. Entry fee per team is $20, however the event is for fans and drivers, therefore a Saturday Grandstand Admission Ticker or Pit Pass will be required to enter the Grandstand area to take part in the tournament. If anyone chooses to just show up for the Tournament they will still be required to purchase a Grandstand Ticket. Other activities on Saturday Afternoon will include a Bouncy House for the Kids to play in, and a Candy Drop. With 2 weeks until the Extravaganza discussions are continuing on what else they might add to the weekend.